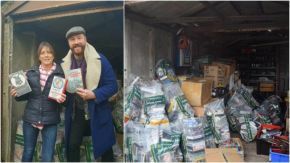 When movie buff Andy Johnson embarked on his 300-mile journey from Liverpool to Brighton, he believed he was setting off to save 2000 video tapes. Now, after returning back to VideOdyssey, it’s estimated that he picked up a total of 4000 tapes, with some rare treasures among them. Since following his dream to open a video shop, Andy has had to expand VideOdyssey after being inundated with a mountain of tapes from well-wishers across the country. But by far, this donation from Marcia Hudson is the most impressive. The thousands of VHS tapes were inherited by Ms Hudson after the passing of her friend, Roy Somerset. They were collected this Tuesday by VideOdyssey owner Andy after she contacted him to see if he could take them and save them from landfill. Andy, who used to work as a clerk in a video shop as a teenager, is now finding himself travelling across the country on his days off to gather people's collections of old gems and save films. He said: “I tried to talk myself out of it, but when I saw what was there, I couldn't stop myself. They're old video shop videos, which need to be saved from the tip! VideOdyssey in Toxteth, Liverpool now has become a time warp to the late 80s and 90s. From older customers, visiting for nostalgia’s sake to younger people in their twenties, searching for a unique way to watch their favourite classics – there’s something for everyone. As well as thousands of new tapes that have been offered to the shop, VideOdyssey also boasts an impressive collection of movie memorabilia and old-school arcade games. Andy said he's thrilled to discover a newly-revived appreciation for this retro style of entertainment - with film fans craving a curated experience rather than scrolling through lists of movies and content to stream online. “My favourite part is watching the delight on people’s faces when they walk in to the shop and are greeted by the huge walls of VHS tapes. What’s next for the ever-expanding shop? Andy says he hopes to receive some funding for it becoming a national archive for tapes. He said: "A lot of amazing movies were never brought out digitally and they're in danger of being lost forever. Not to mention the millions of hours of precious family memories that people only have on VHS tapes.